At sixteen years of age I was invited to lunch at the family house, in the beautiful Langhe area of Piedmont, by a young doctor who’d been to London to train at the now sadly defunct Italian Hospital in Queen square. I ate the most scrumptious meal I can remember and then we talked about music about which I was beginning to get interested in. Gino put on a record of something which immediately grabbed my attention by its lively themes and freshness. “La Serva Padrona” it was and I’ve been hooked on Pergolesi ever since. Returning to London I spent all my hard –hoarded pocket money on a recording of this delightful intermezzo with the late-lamented Anna Moffo who only died in 2006 and with bass Paolo Montarsolo, and conductor Franco Ferrara, a 1962 RCA recording which I still treasure and do not feel has been surpassed despite the great developments in period playing and interpretation which have taken place since then. 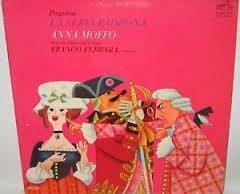 Gino also pointed out to me other Pergolesi operas, including one written in Neapolitan dialect Lo frate ‘nnamorato. But the only other recording I managed to hear of Pergolesi was his last poignant farewell “Stabat Mater” written while dying of consumption at the convent in Pozzuoli. And so my knowledge of Pergolesi remained at a stalemate for years. Apart from a frankly awful production of La Serva Padrona at Tregynnon Wales I never managed to hear any more of this wonderful composer born in Jesi and who died at the tragically early age of 26 – apart, that is from that blancmange concoction cooked up by Stravinsky in his 1920 ballet Pulcinella, which at least got the ball rolling again for Pergolesi. That was my state regarding Pergolesi’ music until the internet and, in particular, WINMX (now sadly hacked to pieces) came along. I managed to get together most of Pergolesi operas which can be divided into opere buffe and serie and, of course, the irresistible intermezzi (of which La Serva is one) inserted between the acts of the opere serie. Furthermore, I increased my knowledge of his religious music which includes a fabulous mass and an exquisite Salve Regina all, on the same league as the more familiar Stabat Mater (which no-one less than JS Bach wrote a paraphrase on and who actually completed Pergolesi’s last unfinished fugue to the work!). But still no live opera performance for me. Until yesterday that is. Pergolesi fans are a very particular breed and I was lucky enough last year to meet one who’d travel from Jesi to Pozzuoli to hear the music which to both of us remains so endearing, so life-enhancing, and so full of freshness. We didn’t have to travel either to Jesi (see http://www.fondazionepergolesispontini.com/fps/index.php?option=com_content&view=article&id=2551&Itemid=2987&lang=it) where there is annual Pergolesi festival) nor to Pozzuoli but to relatively nearby Pisa where, in the Sala Titta Ruffo of the city’s great Verdi theatre, the ensemble Barocco di Maggio Fiorentino Formazione, directed by Frederico Bardazzi, put on a performance I would have travelled far vaster distances to hear. Il Flaminio tells the story of Polidoro, a rich Neapolitan, and his sister Agata, who live in a fine villa outside Naples with a household consisting of his secretary Flaminio (known by the rest under his assumed name of Giulio) who is in love with the young widow Giustinia who is favourably attracted to the youth who reminds her of an old lover of hers, also called Flaminio, when she was still nubile. Agata has also fallen in love with Giulio Alias Flaminio while Polidoro has fallen in love with Giustinia. To complicate matters Agata’s fiancé Ferdinando arrives at the country house (hence the nice back projection of an herbaceous border) while the two servants, Checca and Vastianio, flirt audaciously with each other. Following various vicissitudes the love between Flaminio and Giustinia develops happily and the young lad will then be able to reveal his true identity when he knows that his love will be returned. Together with them the other couples, Agata and Ferdinando are reconciled to each other and all ends happily ever after in a grand finale with dreams of love and faithfulness fully realised. The recitatives were spoken and had to be translated from Neapolitan for the benefit of the mainly Tuscan audience. But what music and what singing! A true little baroque instrumental ensemble, complete with corni da caccia, baroque bassoon, theorbo, baroque guitar and baroque oboes shows that, after a late start in the field, Italian baroque ensemble know the “authentic” business to the full and produce a sound that is in every way more “period” than their pioneers in Holland and the UK. For me the top-class singing came with Silvestri’s Flaminio and Grassi’s saucy Checca, outstanding not just for vocal delivery but also for acting. The evening started at 8.30 pm and ended after midnight. There was just a short interval, the hall became hotter and hotter and the seats were rather hard. But such is the magic of Giovanni Battista Pergolesi’s music that it took over any thoughts of discomfort. To walk back through a gorgeous city like Pisa in the small hours was to be as happy as a tom cat in love and as light as a passenger in a Montgolfier balloon. Truly a night at the opera to remember! The person who commissioned the Temple of Minerva Medica at Montefoscoli described in my previous post, Andrea Vaccà Berlinghieri was the son of Francesco Vaccà Berlinghieri (1732-1812), professor of medicine at the University of Pisa. 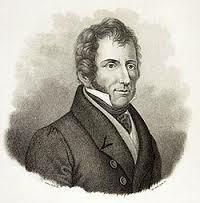 Andrea Vaccà Berlinghieri was born in Montefoscoli in 1772 and died at Orzignano, near San Giuliano Terme (Pisa) in 1826. He is remembered as a pioneer in pressing for more suitable hospital facilities and designing more adequate and efficient surgical instruments – a necessary thing in the days before anaesthetics when the best way to keep patients calm during operations and amputations was to get them blind-drunk. Andrea Vaccà Berlinghieri was sent by his father to Paris to study medicine. After two years there, Andrea went to London to work under the Scottish surgeon John Hunter, (1728-1793), one of the most distinguished surgeons of his day and an advocate of precise diagnosis in medical science. In 1791 Andrea returned to Pisa from London, where he graduated in medicine and surgery. Two years later Vaccà wrote a treatise on surgical techniques and began to give well-attended lectures. In addition to medicine Andrea devoted himself to the study of chemistry, physics, mathematics and astronomy. Andrea Vaccà Berlinghieri became Professor of Surgery at Pisa, and is regarded as the founder of Pisa’s Medical School. The excellence of Pisa’s Ospedale di Santa Chiara, where I have, on occasions, had to visit friends in serious clinical conditions, is in no small part due to Vaccà’s efforts in improving hygiene practise and diagnosis methods. During his stay in Pisa the poet Percy Bysshe Shelley and his wife Mary Shelley had the chance to know, appreciate and be treated by Vaccà. In their meetings they would also share their passions for architecture, poetry and esotericism. In particular, Vaccà’s surgical experiments, including the stitching together of different body parts and the use of galvanic batteries to make muscles convulse, inspired Shelley’s wife to write her famous gothic novel Frankenstein, an amazing achievement for a nineteen-year old and one whose financial returns enabled her to bring in much needed funds for their exile in Italy. 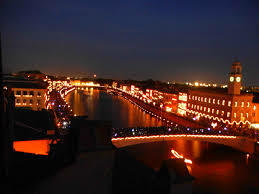 (Indeed, there are letters stating how both Shelleys followed intently the sales of Frankenstein while living in Bagni di Lucca). How I would have loved to be a fly on the wall at their convivial meetings! I was privileged to spend the night in Vaccà’s home in his native town of Montefoscoli. Lady Sophia Donalisio, Vaccà’s direct descendent, has excellently turned the palazzo into a house-museum where her forefather’s medical treatises and surgical instruments are displayed. I was reminded a little of the Hunterian museum in London – without the rodent ulcers, of course! Montefoscoli is, itself, an exquisite Tuscan borgo to visit and is filled with many picturesque corners. It also has the most delightful long views over southern Tuscany. There is even more to see at Vaccà’s palazzo since, attached to it, is one of Italy’s best museums of by-gone peasant life with fascinating insights into the way viniculture, bee-keeping, threshing and agricultural life in general was conducted when Italy was a barely industrialised country. 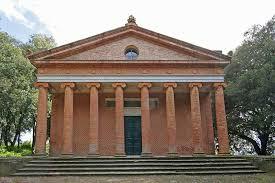 I’d seen a picture of it somewhere before – a mysterious, autumn-red-brick ionic-style temple deep in the Tuscan countryside south of the Arno – and it captivated me. When would I be able to get to see it? In March 2006 I was teaching young people at IPSIA in Castelnuovo di Garfagnana. IPSIA stands for “Istituto Professionale dell’Industria e del Artigianato” (professional institute for industry and crafts). I suppose the English equivalent would be some form of technical college and, like the archetypal “tech”, the intake was not particularly drawn to high academic achievement. Most of the students believed they were second-best to those who got into the more prestigious Liceo and part of my job in teaching English, I felt, was to convince them that they were not failures but were also able to achieve. 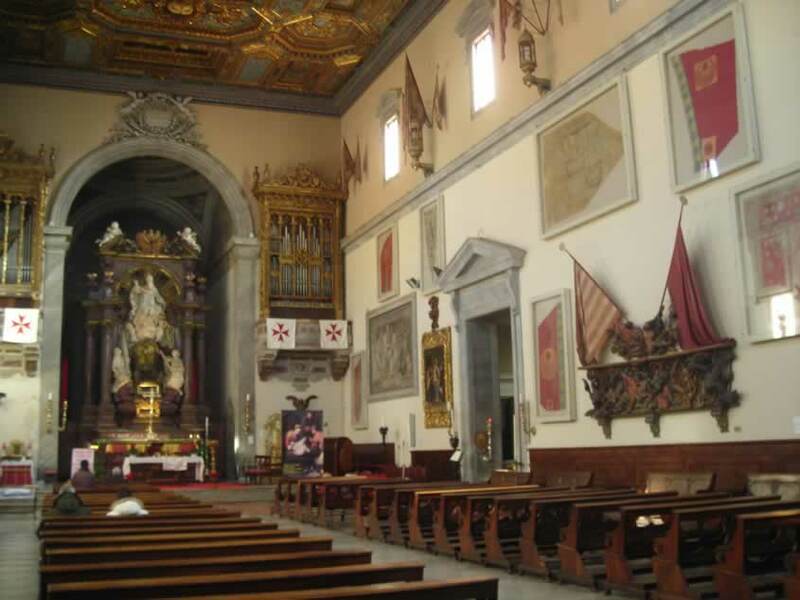 I checked out where the temple was situated: near a little town of Montefoscoli deep in the Pisan hills. On the moonlit night I started out on my scooter and decided the best route there would be to go over the Trebbio pass from Benabbio to Collodi, across the Arno valley and thence proceed into the Pisan hills. It wasn’t the fastest route but it was definitely the coldest! By the time I got to Montefoscoli I had virtually turned into an ice-block. Fortunately, the farmhouse near the temple where we met up had a roaring wood stove going and I practically sat on top of it to de-congeal myself. There is a steep learning curve as far as routes and temperatures are concerned in Italy. I didn’t know March could still be so cold, especially at night. I don’t think I’d repeat the same experience. But I would repeat the visit to the magical temple and have done so. It is such an arcane place and so dreamlike, especially under full lunar influences. The temple of Minerva Medica is a neoclassical building located near the borgo of Montefoscoli ,which is in the province of Pisa. It was built around 1823 by the architect Rodolfo Castinelli and commissioned by Andrea Vaccà Berlinghieri, a famous doctor of medicine and luminary of the University of Pisa, with the main intentions of erecting a memorial to his father Francesco, also a doctor in Pisa, and of celebrating their profession with a dedication to the goddess Minerva of medicine. The structure, preceded by a portico of eight Ionic columns and surmounted by a pediment, stands on a hill in a small grove of holm oaks which had once covered a much larger area. The temple’s surfaces are characterized by the use of brick which imitate ancient Roman opus reticulatum work. The finish of these bricks and of the whole work is of incredible finesse and reminds me a little of another monument of similar material that I would later that year visit in the UK: the Watts chapel in Surrey (see http://www.wattsgallery.org.uk/watts-chapel). Inside the temple an atrium leads into a semi-circular hall which has substantial remains of its original decoration. There is an upstairs inner balcony which must have acted rather like a minstrels’ gallery. 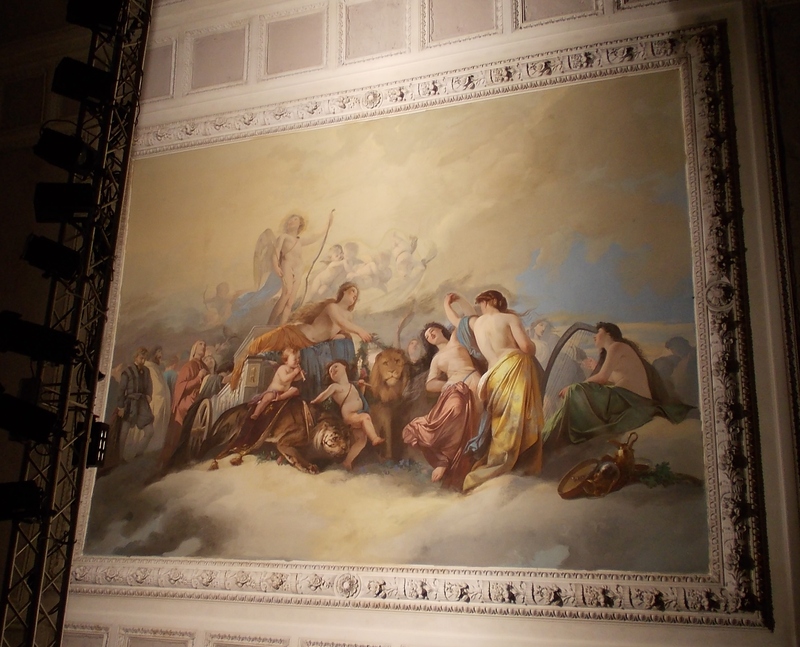 It is now generally agreed that the building, in addition to its function as a memorial and as a place for diversions and entertainment, was also a Masonic temple since there are characteristic symbols of the secret society (or is it a “society with secrets”?) dotted around the temple. Since that initial visit the temple of Minerva Medica has played a significant part in my life. I’ve been to chamber music concerts there and during the day it’s a lovely place to walk to from Montefoscoli. Needless to say, I didn’t have to scooter back to Longoio that night. I was invited by the descendant lady of the Vaccà family, to whom the temple belongs, to stay at her palazzo in Montefoscoli where further delights awaited me. But that is another post. Once, baptism could only be performed by a bishop at his cathedral site. Baptism in this location could only be performed three times a year and so accommodation had to be provided for a considerable number of neophytes on each occasion. 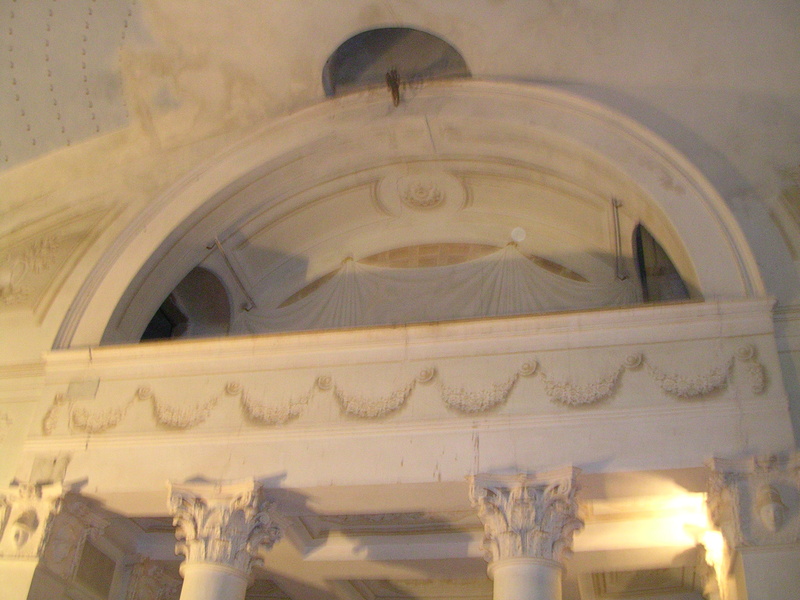 A secure location had to be found for baptism to prevent “private” baptisms. The advantage of having a separate baptistery building was that its doors could be sealed up by the bishop after each use, thus thwarting unauthorised baptisms. In the Roman Catholic Church baptism was by total immersion until ritual changes wrought from the eleventh century onwards. This required a large font (still to be seen in many locations – for example, in our area at Codiponte) and, preferably, a separate building for it where neophytes could even expect a fireplace to warm up after submitting themselves to the rite. With the later relaxation of rules about which church clerics could perform baptisms, the increase of baptism of newly-born infants vis-a-vis adult converts, the change of baptismal rites from immersion to aspersion (sprinkling of water) or affusion (pouring of water), the permissible times for baptism to be performed and the reduced need for large fonts separate baptisteries in Italy were very rarely constructed after the ninth century and therefore usually remain the oldest ecclesiastical buildings in any cathedral complex. Baptisteries are also the only ritual church buildings to be always built in a centralised plan – usually octagonal or circular. There are exceptions of course: the famous round churches built throughout Europe on the plan of the Holy Sepulchre in Jerusalem and those built under the influence of renaissance architectural theories which provoked a tug-of-war between Greek and Latin cross plans. Saint Peter’s Rome, for example, was originally designed as a Greek cross (as was St Paul’s on London) but liturgical obligations altered the original plan. 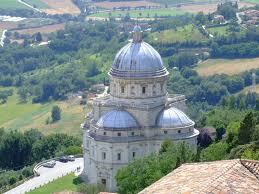 Only certain buildings, such as Todi’s Santa Maria della Consolazione, were fully realised according to the centralised Greek cross plan and they remain among the most beautiful churches in Italy. Lucca, too, has a baptistery although its centralised plan is engulfed within the later church of San Giovanni e Reparata (the one where the city’s Puccini Festival is held). Recent archaeological excavations have revealed some very interesting remains of the original baptistery dating back to palaeochristian times which must rank among Lucca’s oldest buildings. The remains include some ancient grapphiti and some fine mosaic fragments. These can all be visited on the same ticket which admits to the cathedral museum (and also to the wonderful views at the top of San Giovanni’s campanile). Our car is still out of action so we are having to rely on our scooter to get around. Let’s hope that we don’t suffer another total immersion, courtesy of the rainy weather, today especially as we are singing for the benefit of three wise men at Ghivizzano parish church! One doesn’t normally go to a hospital to view its architectural features. I went to the Santa Chiara hospital in Pisa to call on a friend who’d literally been run over by a bus (and dragged some distance by it too!) Apart from suffering various bone breakages (including the pelvis) she has had to go in for some considerable skin grafting too. I visited her in the hospital’s plastic surgery department and found a smiling and strong will to get through the very considerable injuries sustained at the beginning of last November in front of Mologno station (the one that serves Barga). It’s a great pity that, with the fashion to go in for new all-inclusive super-hospitals, they are eventually going to close the whole of Santa Chiara as it moves to Cisanello. 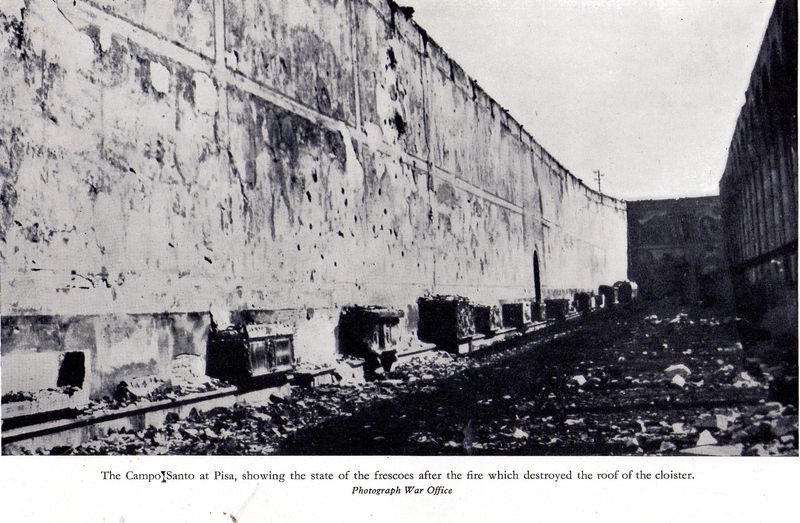 (The same is happening to Lucca’s loved hospital at Campo di Marte – see my post at https://longoio.wordpress.com/2013/09/25/hungry-hornets/). Santa Chiara is indeed a beautiful hospital and a very ancient one too. Founded in 1257 on one side of the Piazza dei Miracoli (better known for a tower which leans) and dedicated to St. Clare it is a lovely example of a centuries-old Pisan tradition history in providing to the sick both in body and mind. Indeed, the guest-house part of the hospital is now used to house the sinopie (or original fresco background drawings) taken from that saddest of Italian artistic war-time disasters – the incendiary bomb-burning of the Camposanto. Now that Pisa now has its new hospital I sincerely hope that the old site will be intelligently developed as it contains a unique architectural heritage dating back to mediaeval times. Of particular interest is the old entrance courtyard and the attractive church dedicated to Saint Clare (and her bosom friend Saint Francis). I love the palm trees too and there’s even a section of the city wall within the Ospedale. I had a friend who spent her last days in the excellent care of this hospital and she was particularly elated to see that leaning tower from her ward window. Later in the afternoon I’d been invited to give a poetry reading and so, to fill in time, I wandered around “Miracle square”. It’s great to be here in a (touristically) quieter part of the year. It’s also great the way the white marble of this totally sublime world heritage complex, which always inspires me, no matter how many times I visit it, becomes sensuously roseate in the setting sun. The sculpture of ships on the tower remind one that Pisa was once the greatest maritime republic in the Mediterranean. The poetry reading at the picturesque location of the very enterprising Pisan publishing house, ETS (see their web site at http://www.edizioniets.com/) went very well indeed. The poems I read included items from Shakespeare, through Herbert to Ms Rossetti, Hardy, Kipling, Frost and Pettitt. All of them were excellently and very sensitively repeated in Italian translations by Renzo Bartalena and Silvia Pasqualetti. Although the audience was not particularly large it was very responsive and clearly glad to be present at the occasion organised by that magister of literary and artistic events, my friend prof. Aldo Baiocchi (of Pisa, of course). Week-ends here are so packed with events that one is truly spoilt for choice. 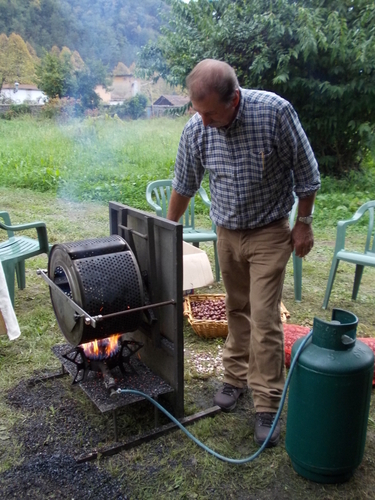 Chestnut festivals are definitely October’s flavour of the month and abound all the way from Piazza al Serchio to Lucca (and beyond). Even Bagni di Lucca had its own Festa yesterday in the gardens of Villa Fiori, a grand mansion now the property of the comune and in sore need of generous hands to restore it to its former glory. 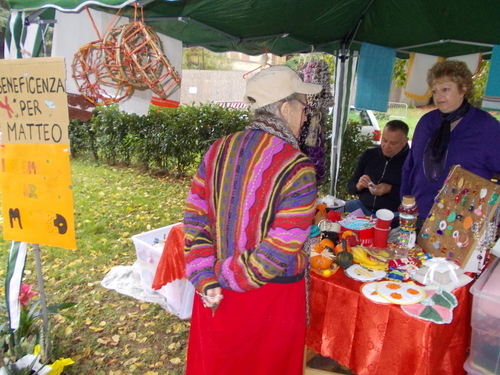 Despite the recurring drizzle the Festa, which is covered in more detail in Debra Kolkka’s blog at http://bellabagnidilucca.com/author/bagnidilucca/, was quite well-attended and there was a good spread of activities, stalls and traditional chestnut-based goodies to eat. I was particularly taken by a stall raising funds for a local child suffering from that terrible rare syndrome: Batten’s disease. 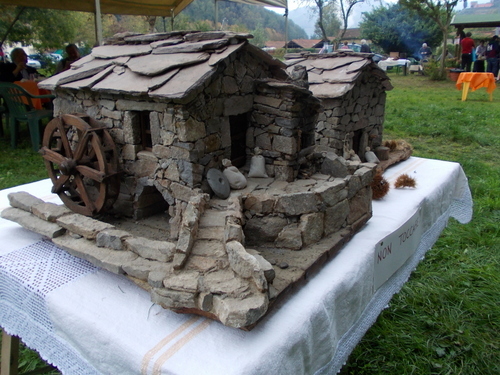 The models of traditional houses were also brilliantly done. From the Villa Fiori we headed for the Pumpkin festival at Piegaio in the Valdottavo. We’d never been to this Festa before and found it extensive, well-organized and full of interesting things. For a start I’d never seen pumpkins grow into such weird shapes! Here are some pictures of the event which happily wasn’t rained off, although probably it would have got more visitors if the weather had been more clement. Pumpkins have a long history of use in Italy and not just as an American import for Halloween. They make good soup and can be used for bread-making. Their skin will make containers of every shape and size and they form excellent sound-boards for musical instruments. 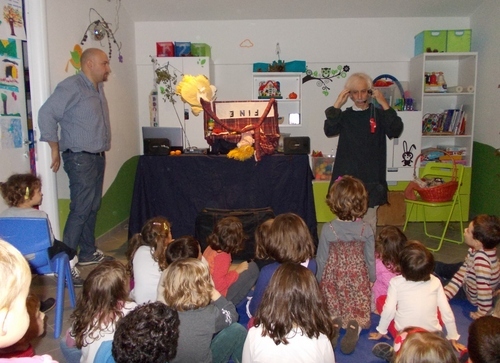 Children and artists also contributed to the delightful Piegaio Pumpkin festa. It was a little sad to see many of the beautiful plane and lime trees lining the avenue leading into Pisa from Lucca hacked down because of tree-disease. I do hope that a replanting programme will start soon. Part of the evidence that one is a reasonably long-term resident in this part of the world is that we go to Pisa no longer to visit the leaning tower but to attend a local marionette show! 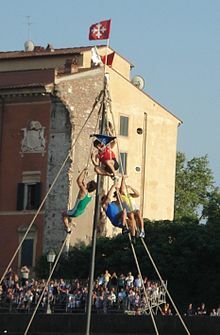 The performance took place in a children’s playground open space recently retrieved from an old factory. Nissim’s approach to puppeteering is original and he calls his concept “marsupial theatre”. It is truly a portable spectacle and Piero even carries the stage by wearing it on himself like an apron (or “marsupio” – meaning either the name for a bum-bag in Italian or a Kangaroo-type animal). The show itself was calculated to amuse the young audience (and us too) and included a variety of songs and fairy stories including a Red Riding Hood which had the children ear-splittingly screaming against the fearful wolf. 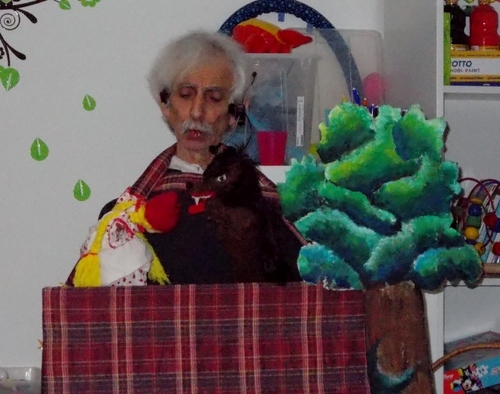 Piero will also run a children’s workshop in puppeteering at the same park. In Pisa it hadn’t rained at all but by the time we returned to Bagni di Lucca the roads had turned wet again although temperatures remain surprisingly mild for this time of the year, hovering around twenty degrees centigrade.